Experience wireless charging at home, at work or on the move with this Qi enabled power bank. Simply place your Qi-compatible device onto the power bank and watch your battery spring back to life. A standard USB port is also included for non-Qi devices. A lot of wireless power. I have a Samsung S7 Edge, and this works a treat with it. It will probably work as well with any other phone that charges wirelessly, but best to check first. I would have liked some form of instruction with it.Flashing lights i assume have somthing to do with charging the bank and it can be hard to position phone to charge. Remove the problem of tangled charging cables with the Qi Wireless Charging Power Bank. When your wireless charging devices are running low, just place them on the wireless charging pad for quick and easy replenishment. One of the many advantages of this Power Bank is that it can charge almost any other device which features USB charging, meaning that it is not limited to devices with wireless charging capabilities. With 10000mAh capacity, you can rest assured that this Wireless Charging Power Bank will keep your devices in action far beyond their own battery power. 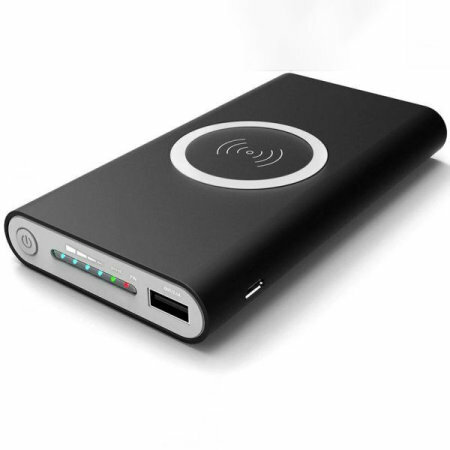 This power bank really is the perfect travel companion for long journeys, holidays and trips. When your power bank is low on power, simply recharge it via the Micro USB port. With the Micro USB port on the side of the device - you can simply plug into a computer, laptop or USB mains power adapter to recharge your power bank. The Wireless Charging Power Bank's compact design, sleek lines and smooth finish make it comfortable to carry and easy to pack away in a backpack, briefcase, or handbag until it's needed. This handy wireless power bank is ideal for taking on holidays, business trips and even daily use. With this portable device, you will always have backup power. This Wireless Charging Power Bank is manufactured to the Qi standard. Qi is the sign of interoperability between power transmitters and power receivers. This means that if your phone doesn't have built-in wireless charging, you can use one of the Qi adapter solutions to convert your phone to wireless charging supported by this pad.